(ii) It was the invention of the Victorian boarding, and very expensive, Public School that persuaded the Victorians that once the ‘playfulness’ of children was over it was essential for a boy to be intensively taught by academics rather than through ‘learning on the job’, as it had been in the generations that gave birth to the Industrial Revolution. Consequently, just as early years education was seen by the Victorians as little more than child-minding which came cheap, so secondary education was accepted as being specialised and expensive, and most often delivered away from the child’s local home community. A century or more later primary education is still allocated significantly fewer funds, and far less status, than secondary (which means that classes are much larger when pupils are young, and smaller with more direct teacher involvement, when they are older). Two. The problem created by the first of these myths is now being recognised as the findings from neurobiological and cognitive science show the vital importance of early childhood nurture. This research is refuting the earlier assumption that intelligence was mainly the result of good genes, and explains the significance of stimulating environments in creating the neurobiological connections in the young brain that lead to higher levels of applied intelligence. As politicians and administrators struggle to allocate more resources to early years learning, so an over-stretched education budget seems unable to cope. 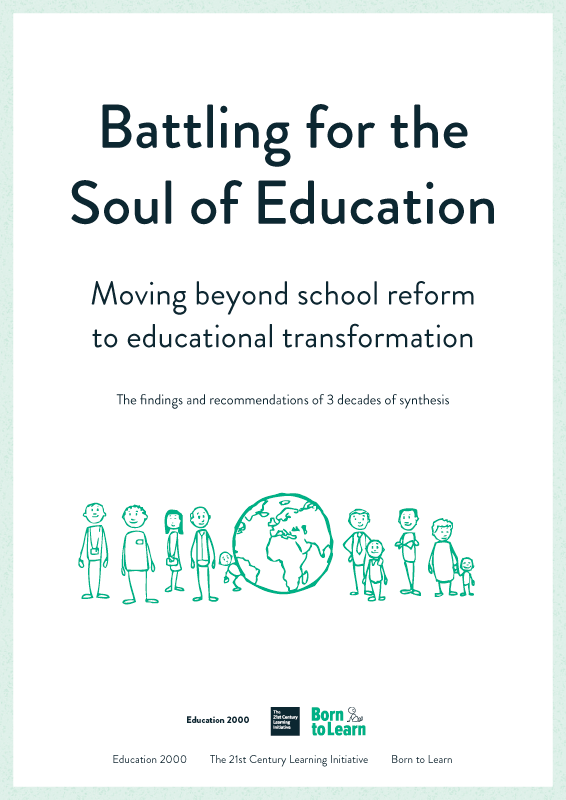 Because the English persist in regarding primary and secondary education as separate entities, and not part of a seamless process, they never consider what could happen if resources were moved from one sector to the other when necessary. Neither do the English any longer appreciate the significance of informal learning experiences in home and community. Five. Because young children have so much learning to do (unlike a cat or a dog which has strong instinctive skills developed in utero, human babies have to learn mainly in interaction with others) they are, in the first ten or eleven years of life, ‘clone-like’ in their learning. They learn through copying, and do it very well, which is why primary-aged pupils are generally content with their schools. So why does it apparently go so disastrously wrong in adolescence, when children who once hung on a parent’s every word suddenly rebel and apparently jettison everything? Six. Longitudinal research over many years is showing surprising, and significant, changes in the structure of the young brain. In the clone-like phase children develop phenomenally complex neurological networks based on predictable responses to well-understood problems. However, from the age of eleven or twelve a biological process begins to fracture as many as one or one and a half percent of these earlier, clone-based, neural networks each year. Functional MRI scans show increasing numbers of disconnected dendrites in fifteen and sixteen-year-olds apparently searching for new connections (rather like a dysfunctional telephone exchange). It begins to look ‘crazy’ – just like the look on a confused teenager’s face! Those neurological findings make it possible to see teenage angst for essentially what it is – a biological process that forces the earlier clone-like learners to start working things out for themselves. Seven. From such a biological perspective, it is essential to shake youngsters out of their earlier clone-like learning otherwise they will only be fit to survive in the world of their parents. Adolescence is a biological opportunity, not a problem; it only becomes a problem if youngsters are not given the space to work things out for themselves. “Don’t fence me in” is the cry of the adolescent craving space to do just that. Here is the rub; for secondary schools to be seen, in managerial terms, as successful, they find themselves compelled to fly in the face of human biology and deny adolescents that freedom because they see their prime task as fitting young people into the world of the adult, not that as understood by the inquisitive adolescent. Overschooled children lead to an undereducated society. Eight. Today’s educational problem is further compounded because the Victorians, in their hurry to capitalise on the enormous wealth created by the Industrial Revolution, never questioned how the invention of the factory and mass manufacturing would destroy apprenticeship and, in so doing, deprive society at large (and millions of adolescents in particular) of a way of learning on the job that could never be replicated in a classroom. Extensive cognitive research has recently shown that the principles encapsulated in apprenticeship – namely that the novice works alongside the master who first demonstrates what needs to be achieved, then breaks the task down into its constituent components, and then drills novices in each task before letting them bring it all together – are deeply engrained in the human brain. It is how, over the millennia, humans have evolved to be. “Doing it for oneself” is none other than an evolutionary survival skill. It is what the grain of the brain is all about. Ten. The second thing that the Victorians forgot, as do many single-minded cognitive scientists in the US and elsewhere, were the pre-requisites for a democratic society that had been set out so well during the 17th century struggle to establish parliamentary democracy. Democracy, as the ancient Greeks recognised, can’t work unless the populace is well-enough educated to use their vote intelligently, and accept that they are all interdependent citizens within a defined constituency. It was why Milton defined “a complete and generous education [as that which] fits a man to perform justly, skilfully and magnanimously all the offices public and private, of peace and war.” Functional democracy, the English have long forgotten, is as much about a way of living, as it is about a way of voting. If it’s really that simple, what should we do? Firstly, the English have to develop a vision of the kind of society that reflects our variegated culture, and genuinely commands mass support. That Milton set out his vision in the midst of a turbulent Civil War (and nearly lost his head when the Protectorate was overthrown) should inspire the British people today, in the midst of their present difficulties, to conceive of an education that really does fit every young person to perform “justly, skilfully and magnanimously.” It has been the lack of such a vision that has left England in its present dilemma – a rich country with nevertheless many dysfunctional young people, too often lacking in magnanimity, and with an adult population unsure of what a generous education actually means. Secondly, the English have to give up building new schools and inventing new systems of governance that deny local people their democratic responsibility to monitor and contribute towards the education of all those who will be their successors. Thirdly, the English have to lose their traditional scepticism of any academic concept that flies in the face of their traditional social aspirations. Quite simply, because our elite public schools were a measure of Victorian greatness, so in the future England will only regain that greatness if we so reverse our priorities and see that the earliest years of education are where our best teachers should be. Secondary education should become the process of weaning young people of their dependence on the classroom, by progressively inducting them into the life of the greater community. Simply put… the earliest years of primary education should be where the classes are smallest, and the teachers so good that secondary education becomes where young people are both skilful enough, and mature enough, to rely less and less on institutions. Fourthly, Parliament must use the opportunity provided by what promises to be a lengthy period of economic constraints to reappraise the basic purposes of education and, in ‘slimming down’ the present structures, have the courage to build learning strategies that go with the grain of the brain, and which recognise the parallel responsibility of parents and community in preparing children for all aspects of private and public life. Knowing what we now know, we no longer have the moral responsibility to carry on with what we used to do. Simple as this may seem, it won’t happen until the English people, individually and collectively, regain a sense of their mutual interdependence, and their responsibility for the future. Nor will it happen until teachers are properly equipped to demonstrate that they know as much about how children learn, and collaborative skills are developed, as they know about the subjects which they teach.